Duffie, the general manager of Mount Pleasant Waterworks, said that before his agency outside Charleston began purifying the water in the early 1990s, the water was also soft; you'd come out of the shower and still feel dirty, he recalled. Today, Duffie has a new concern — a request by Google for permission from South Carolina regulators to pump more groundwater than they're already entitled to for their data center in nearby Berkeley County. "We've invested a lot in making sure the groundwater quality that we treat and send to the customers is of high quality. We also want to protect the quantity side of that," Duffie said. Google currently has the right to pump up to half a million gallons a day at no charge. Now the company is asking to triple that, to 1.5 million. That's close to half of the groundwater that Mount Pleasant Waterworks pumps daily from the same underground aquifer to help supply drinking water to more than 80,000 residents of the area. Google spokesman Patrick Lenihan said the company needs the water to cool its servers. "It takes a lot of energy to run a data center, so we use water to cool them down," he said. Lenihan said Google has brought about 400 jobs to the region, and said the company is taking steps to conserve water and energy while also preparing for the needs of the future. "The internet is constantly expanding and data centers allow the internet to continue to do that. We're very long-term thinkers in terms of capacity, so we're always preparing for more growth," Lenihan said. 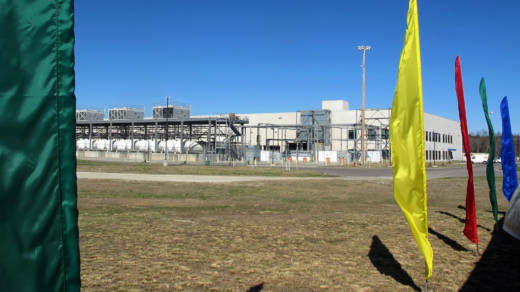 Google wouldn't allow NPR to see the inside of its South Carolina data center, which opened up nearly a decade ago in Berkeley County. But it's in a suburban area surrounded by woods and office buildings, and protected by a guard shack and fence. The only real clues to what's happening inside are a couple of Google logos on signs outside the gate. "It's great to have Google in this region; folks are proud to say that Google calls Charleston home," Cedzo said. "So by no means are we going after Google ... Our concern, primarily, is the source of that water." Cedzo notes that in Georgia -- another dry, Southern state -- Google is using recycled wastewater at its data center in Douglas County. "Google footed the bill for that," Cedzo said. "So if they're doing it there, why can't they do it here?" Lenihan, the Google spokesman, said the company makes such decisions based on the needs and characteristics of each site. He said Google's consultants settled on groundwater as the preferred option in South Carolina. "We're a data company; we care a lot about data and making decisions based off of that, so we did a lot of homework," he said. With its six data centers nationwide, Google is just one of several major tech companies operating centers in relatively dry parts of the country, like eBay in Salt Lake City and Microsoft in San Antonio. A 2016 report by the U.S. Department of Energy noted that as the industry expands, the data center sector is using an increasing amount of water for cooling and electricity generation. In that report and elsewhere, the federal government is also looking at resource concerns created by its own data centers. Monica Witt is a sustainability program manager at the federal Los Alamos National Laboratory, which operates several large data centers in New Mexico. Witt says the lab has to share its water with residents of the city of Los Alamos. "We know that supercomputers and data centers are just going to use more and more water, so communicating to the community how much we're going to use in the next 10 years and planning with them has been really helpful," she said. Witt said the lab has taken several steps to reduce its water use, including reusing wastewater from toilets, sinks and other sources. The tech industry as a whole has been a leader in adopting environmentally sustainable practices — like reusing water and opting for renewable energy sources, says Alfonso Ortega, a professor of energy technology at Villanova University. But for communities that host data centers, Ortega said there are tradeoffs between economic and environmental impacts. "The consumption of their water competes with every other need for that water," Ortega said. "One would hope that community leaders would be able to balance the benefits of having that data center in the community compared to the water that they're going to consume." In South Carolina, Google's request for more water is also raising concerns from Rep. Mark Sanford, who recently wrote a letter urging state regulators to take their time developing a comprehensive plan for managing groundwater, and to delay Google's permit request until more information can be gathered. Duffie said, in some ways, he's pleased that the debate over Google's data center is heightening local awareness about the long-term sustainability of the water supply. "It's raised the issue that these resources are not limitless," he said, "that we do need to manage them."